The Living Memories Project is a collection of inspirational personal accounts from more than 30 people, each sharing their own unique stories of how they have or are carrying on the memories of someone they loved. Nick Clooney (some younger readers may only recognize his name if I say he is actor George Clooney’s father, but many will recall seeing him as the host of AMC’s American Movie Classics, or recall that he is the author of “The Movies That Changed Us: Reflections on the Screen.”) Discerning readers will also recognize that he and son George traveled to Darfur in 2006 to film a documentary about the genocide taking place there. He writes of the deaths of his two sisters, Rosemary and Betty Clooney, both of them world class singers. Other stories contained in the book are just as inspiring, but are written by people whose names are perhaps not as well known. Each storyteller has lost someone dear to them, and each shares a bit about how they keep their memories alive through memory quilts, the arts, scholarships, poetry, recipes, and many techniques. This is a book you’ll actually want to savor, especially if you are thinking about how you’d like to best honor the memory of someone special whom you’ve lost. Or even if you’re looking ahead to how you personally would like to be remembered. 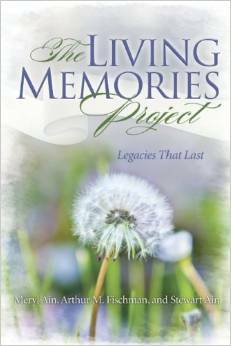 The Living Memories Project is founded on the concept of keeping alive those who are important to us, even in death. It is the brainchild of authors Meryl and Stewart Ain, and her brother, Arthur M. Frishman, and according to Stewart, the concept for it originated with his wife Meryl, after the death of her mother. Meryl Ain holds a BA from Queens College, an MA from Columbia University Teachers College, and an Ed.D. from Hofstra University. She began her career in education as a social studies teacher before she became an administrator. She is also a freelance writer specializing in issues related to education, families, parenting, and children and has contributed to Huffington Post, Newsday, the New York Jewish Week and the New York Times. She embarked on The Living Memories Project after she lost both her father and mother within a year and a half. She and her husband, Stewart, live on Long Island. Arthur M. Fischman holds a BA from Queens College and a JD from Temple Law School. He is a freelance writer whose video and interactive scripts have won numerous awards, including a Telly, an ITVA Silver Award, and a New York Festivals Bronze World Medal. He co-wrote the award-winning documentary Ditital Dharma and has written radio, TV, and print ads for leading consumer product manufacturers. Arthur is a veteran speechwriter and ghostwriter, and was director of executive communications and internal communications for a Fortune 500 company. He lives in Philadelphia, where he also writes plays and moonlights as a jazz pianist. Stewart Ain is a graduate of CW Post College and holds an MA from the Columbia University Graduate School of Journalism. He is an award-winning journalist with more than forty years of experience, and was a Pulitzer Prize nominee three times. He has reported for the New York Times, New York Daily News, New York Jewish Week, Long Island Business News, and Lifestyles Magazine. Stewart frequently appears on television and radio, and hosts his own weekly cable TV program, Jewish Life, and has been a regular guest on The Leon Charney Show. Both his parents died while he was working on The Living Memories Project.